Arsenal prepared to move for Manchester United midfielder? 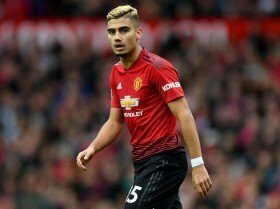 Arsenal have reportedly earmarked Manchester United midfielder Andreas Pereira as a probable target to reinforce the squad in the current transfer window. The 23-year-old was entrusted into the United first-team this term after a fruitful pre-season with the club but he has since struggled for gametime with just three starts and five substitute appearances. According to UOL Esporte, the Brazilian's situation has caught the radar of the likes of Arsenal, Everton and West Ham United with his existing contract due to expire at the end of the season. Still, United may resist a mid-season sale for the Brazilian, given they have the option of prolonging his contract by a further year with the means of an extension clause. Aside from Pereira, Matteo Darmian has also been regularly linked with a move away from Old Trafford and reports have indicated that he could return to the Serie A as early as this month. Arsenal identify Aaron Ramsey replacement? Tottenham Hotspur ready to offload Kieran Trippier?